Buried in the depths of the fairy-tale forests of Belgian Ardennes, the village of Redu was built in an age when it was thought that things would last. Its 9th century mill ‘Le Moulin de Molhan’ looks across the trees up to the sky, its beautiful stone houses dating from the 1600s are breathing out the Belgian history. The town’s 15 secondhand bookshops filled with volumes of the Great Expectations, In Search of Lost Time, Bonjour Tristesse; a paper manufacturer; a potter; a book binder and a dozen of artisan shops – an unprecedented portrait of a village of only 400 inhabitants. What is more astonishing is a veggie bookshop café ‘La Reduiste’ nestled in the middle of this time-honoured settlement. Traditional African masks hang silent on the walls. Zillion of books, diverse portraits, bronze sculptures, paintings and photographs of 4 different expositions that currently take place at ‘La Reduiste’ are playing tricks on the imagination of a visitor. The blackboard menu features animal-free delights: veggie cheese bread, chili sin carne, falafels, oeufs au curry, goat cheese and spicy vegetable soups. Though old, ‘La Reduiste’ is marvelously kept up and partly modernized. Its business now is mainly book selling, art events and vegetarian/vegan cuisine. For Holland-born Anthe Vrijlandt and a Belgian-Native Johan Deflander, a couple who spent almost two decades in Africa and got to know the Black Continent inside out, settling finally in Redu was a return to their sources. ‘Redu is a place to meditate, to absorb a distinctive scent of thousands of leather-bound books and energies of hundreds of authors’, confesses Anthe. In 2015 the adventurous couple moved back to Belgium with an intention to finally settle and start a project of their own. 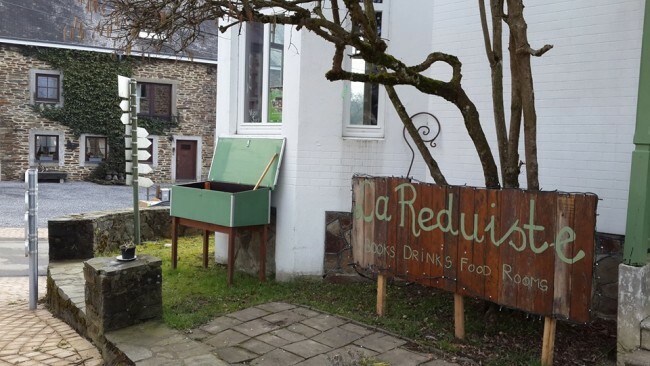 Their accidental visit to the book village of Redu was a fateful one: the duo was so infatuated with an old bookshop ‘La Reduiste’ which was on sale at that point, that a few months later the family decided to take it over. After an extensive reconstruction, they opened the doors of the reconcepted ‘La Reduiste’ in summer 2015 together with several other partners. ‘The aim was to create a modern, welcoming, healthy and thoughtful atmosphere’, says Anthe. 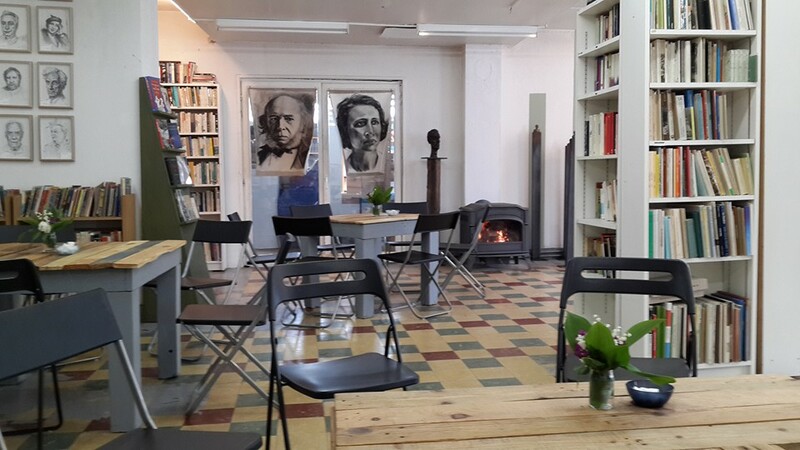 The veggie bookcafe quickly established itself as one of the most remembered ‘sights’ of the book village of Redu. Its concept is a perfect balance of aesthetics and comfort, commitment to cultural heritage and at the same time constant craving for innovative thinking. Johan’s approach to business is photographic. He had worked in Africa as a documentary film director, using photography and film montage to communicate a new image of Africa: less banal and trivial. In less than a year at ‘La Reduiste’, Johan had an opportunity not only to use all the tools and techniques of the craft (scenography, directing, montage) but also shaped the image of the café, going far beyond simply doing his job well. 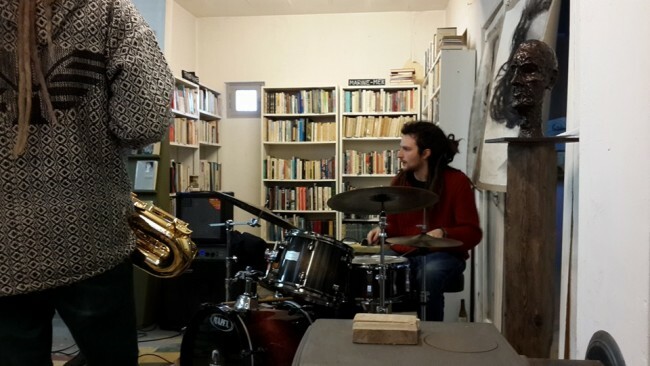 There is the precision of a juggler who –having practiced for a long time – can manage all the components of a project (bookshop, veggie café, art event venue and even b&b) without any apparent effort. While sipping his second or third espresso, Johan delves deeper into the story of the couple’s initiative. ‘La Reduiste opened during an interesting time, the time when genres, styles and services converge. Indeed, by now in the 21st century, we have well-established business forms that we easily identify whenever we are exposed to them. We immediately recognize shops, cafes, galleries, concert halls when we see it and hear it. We even classify each of those forms into various categories or genres, like bookshops, jazz cafes, photo galleries, etc. But how do we deal with the fusion of these business forms? Increasingly, it becomes not so easy to classify a business establishment. 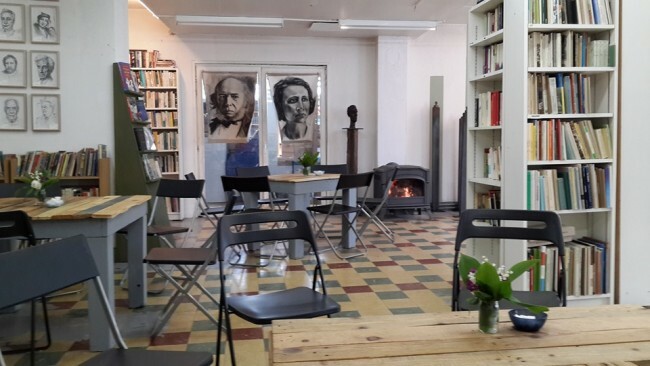 Think about this for a moment – how do you classify a convergence of a veggie café, a bookshop, an art venue and a b&b? What do you call it? We call it “La Reduiste”, says Johan. However, in order to understand why we combined those components together, it seems logical to me to explain the purpose of our enterprise and its philosophy’. Constructive nonviolence is an essential part of the philosophy of ‘La Reduiste’. They do what they can against the culture based on enslaving animals and exploiting the surroundings. ‘Our cuisine is strictly animal&eco-friendly and is based on the idea that in order to make life better a person must first recognize every other being as their own self’, says Anthe. “Our bread is home-baked by one of our neighbours who does it for his family and friends for decades already. Main dishes, cookies and deserts are made by myself, out of plain and healthy ingredients – organic sugar, flour, fresh butter, with fresh fruit and vegetables to add moisture, flavor, and texture’. When choosing recipes Anthe is mostly inspired by African cuisine and her native fondness for cheeses. For your notice, the cheese bread that they serve with soup and other hot dishes is mouthwatering. In continuation of our discussion of the philosophy of La Reduiste, we move from ‘food’ to ‘food for thought’ – reading is constructive rest. All you need is a few hours of time, a book, and a quiet place to sit down. Shelves and shelves of books is what brings visitors to this forgotten part of Belgium – the village of Redu. “La Reduiste” is one of 15 secondhand bookshops of the village and has a curious variety of publications for sale. ‘A substantial amount of books were inherited from the previous owners’, says Anthe. ‘The rest is our own collection which grew throughout the years’. ‘It’s easy to open a bookshop if you are in your mid-forties and you’ve always been a booklover. A home library is a growing organism which, at some point, does not fit the physical space of your living room. That’s when opening your own bookshop saves your life”, laughs Johan. Bookworms discover here old copies of books with other people’s names and bookplates in them. We were lucky to buy a rare 1987 publication of Jeanette Winterson’s “The Passion” and ‘Three Novels’ of Henry James published in 1968. If you adore the feel of old print and long forgotten bindings then the village of Redu is worth your visit. 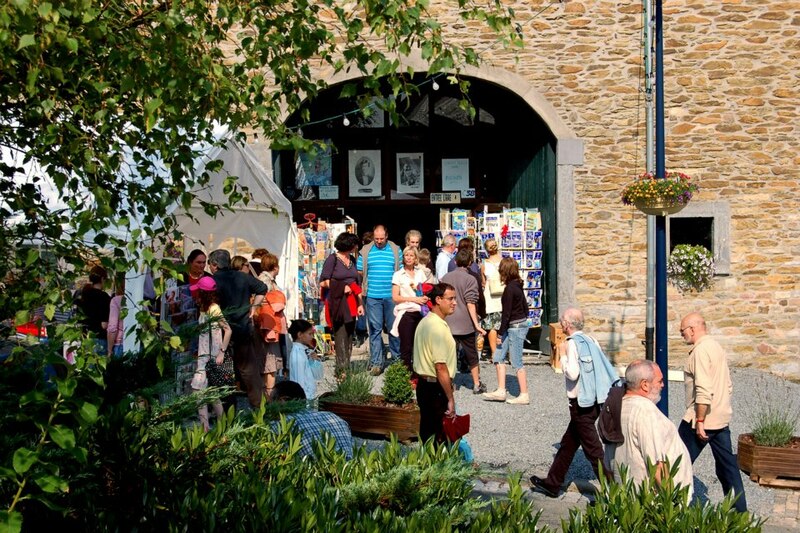 A part of “La Reduiste” is used as an exhibition space which regularly presents painting, photo and sculpture artworks by leading and emerging European artists. This spring’s exhibition is a riot of portraits: painted portraits, charcoal portraits, photo portraits and metal face sculptures. Hundreds of eyes seem to follow you wherever you move and give you the uncanny feeling of being watched – the most memorable impression you retain of the visit to the expo. 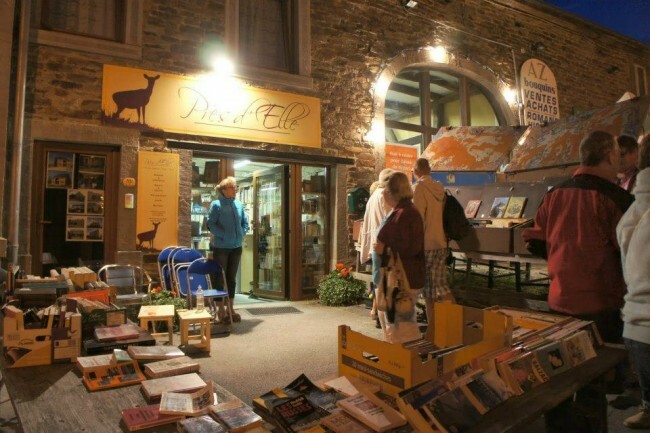 “The Night of the Books” is one of the most popular summer events of the booktown of Redu. On the first Saturday of August spectators unwind under the stars with great music, street theater performances, nature-inspired cocktails and dozens of bookshops open all night. Visitors can always book one of the lovely rooms of b&b ‘La Reduiste”, showcasing a terrace and views of the remains of the old flattened Ardennes mountains. 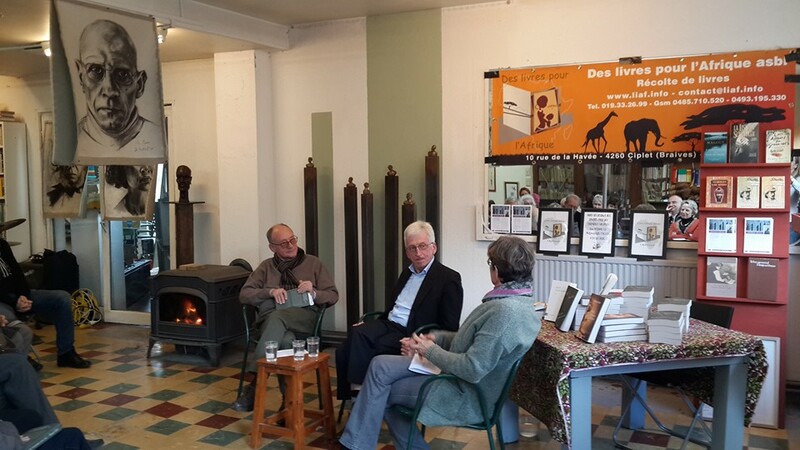 Actually, it does not matter if its spring, summer, fall or winter, the book village of Redu with its charismatic protagonist ‘La Reduiste’ are worth your memory all year round. Marina Kazakova is a transmedia researcher, poetry visualizer, and a writer. She graduated from the department of Transmedia of Saint Lukas University Brussels with an art-based research thesis on ‘How to Visualize Poetry.’ Currently, she runs her own artistic production «Seanema».